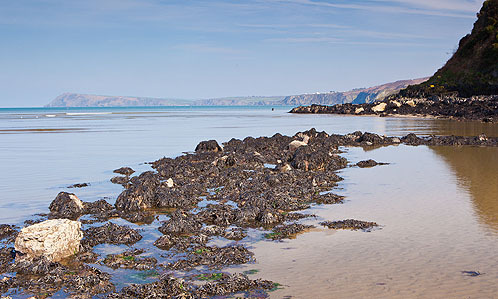 A Medieval Fish Trap , to the South East of Fishguard Harbour , the stones of the structure are visible on a low tide ( below 0.5m ) . Dinas Head in the distance. The 40m long arms of the V shaped structure are built from large boulders . Fish traps In Ceridigion (Aberarth , llanon) and Carmarthen Bay , Swansea Bay used a combination of stone structures and willow fences to catch fish.